It's time for Screenshot Saturday number twenty-five of OddBall! This past week I've veen continuing to work on new levels. I'm nearing the last collection of puzzles in the game, and these include the latest new object: rotating platforms. 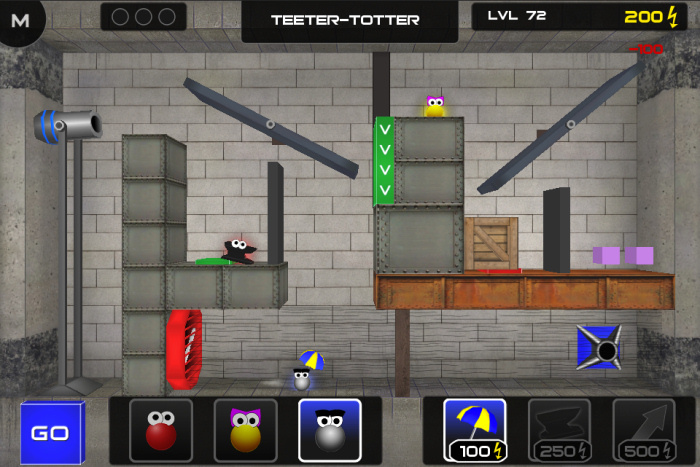 Today's screenshot shows a level with two of these rotating platforms. These metal seesaws are easily moved (rotated) with the force of heavier objects such as the metal OddBall, crates and anvils. But you also need to plan how to get all of the OddBalls past them. These last few levels include more physics-based interactions that will challenge the player to have mastered control of the OddBalls.